As promised, Netflix instant streaming has made its way to the iPhone and iPod Touch. The app, already available on Apple's iPad, lets you browse and watch movies and TV shows from Netflix's streaming library over Wi-Fi and 3G. It's simple and straightforward, and works as advertised, though it's not without a few flaws. 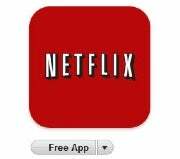 The Netflix app is free, though it requires a Netflix subscription, which starts at $8.99 a month. Once you download the app (it will run on iOS 3.13 and higher) and sign in to your Netflix account, you can browse titles available through the Netflix Watch Instantly Service. The app's home page, which unfortunately relies on low-res graphics that don't take advantage of the iPhone 4's Retina display, offers several options: Movies You'll Love, New Arrivals: Movies, and New Arrivals: TV. You'll also see an additional category of movies, based on your personal preferences, as determined by past Netflix activity. Tabs at the bottom of the screen let you switch between this Home page, a Genres page, Search, and your own Instant Queue, if you have one set up on your Netflix account. Browsing through and searching for titles is as easy as it sounds, though you can expect to do a lot of scrolling on the iPhone's 3.5-inch screen. Once you find a title you like, you can add it to your Instant Queue or start playing it immediately. 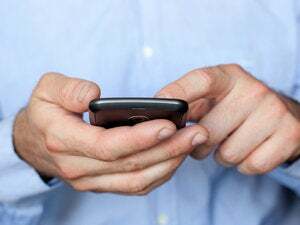 Video playback is allowed over both Wi-Fi and AT&T's 3G network; while the latter may seem surprising given the restrictions that AT&T has placed on video apps in the past (think Sling Media's SlingPlayer Mobile), it may have something to do with the carrier's new data plans. iPhone users who are not grandfathered into an unlimited data plan now have strict monthly data limits, and must pay for overages. So perhaps AT&T can afford to be more generous with its 3G network now that users will be paying for each bit and byte of data that they use. Even with an unlimited data plan, however, I wouldn't want to watch too many movies over a 3G connection. When I tried to watch "Angels & Demons" over 3G, I was so irritated by the constant buffering that I couldn't enjoy the movie. I was testing the Netflix app in my house, where 3G coverage seems to be on the weaker side, however, varying between one and two bars, sometimes going as high as three. Video playback improved dramatically once I connected to a Wi-Fi network, however. Movies started quickly and looked great on my iPhone 4, without any buffering or pausing at all. The Netflix iPhone app gives you a slider bar for fast forwarding and rewinding content, and while it's a bit small to use with much precision, I found that the movies jumped forward or back in the blink of an eye -- no buffering here, either. If you receive a call while watching a movie, the Netflix app automatically pauses so you can decide whether to accept or reject the call. Once you disconnect the call, you're taken right back to the Netflix app, where you can resume your movie. Incoming texts will pause the movie, but display right on top of it, so you can read the message and resume your movie as soon as you're done. The Netflix for iPhone app is not perfect, however. While you can add titles to your Instant Queue, you can only add them to the very bottom or top of the list -- there's no option for re-ordering the list here. And you can forget about your DVD queue entirely: the Netflix iPhone app is entirely centered around Netflix's Watch Instantly feature, and has no options for adding movies to or re-ordering your DVD queue. 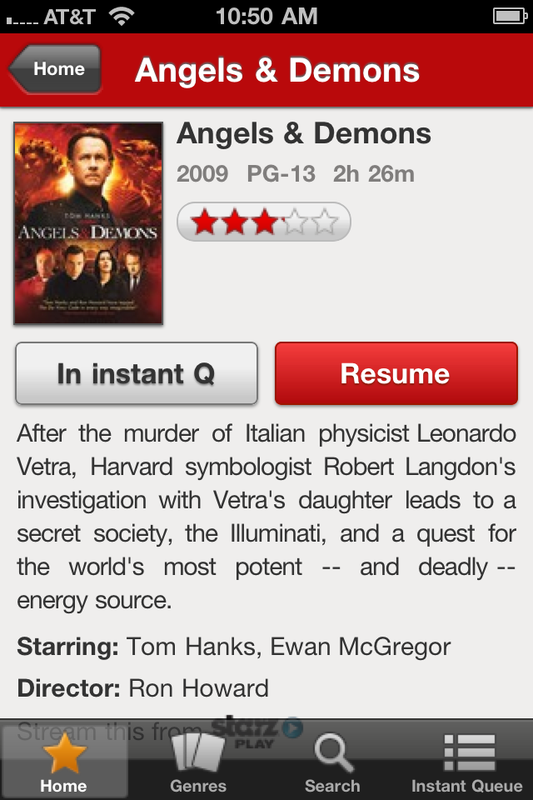 Based on this app alone, you'd think that Netflix doesn't even offer DVDs. It's a shame this feature is missing, especially considering that so many third-party apps offer this functionality. Missing DVD features aside, I really liked using Netflix on my iPhone. It would be great if the phone's screen was bigger -- after watching Avatar on the Samsung Vibrant, I've been spoiled by that phone's 4-inch screen. I'd also like it if Netflix's collection of Watch Instantly titles was a bit broader, but that should happen with time. For now, I'm satisfied. Earlier this week, I was thinking about canceling my Netflix account. 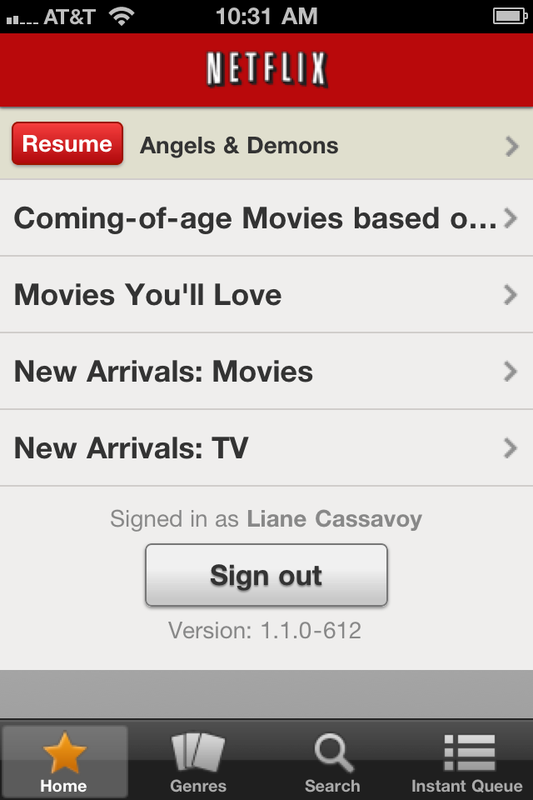 But now that I can watch movies on my iPhone, I think I'll remain a subscriber a bit longer.